Open architecture allowing to optimize solutions. 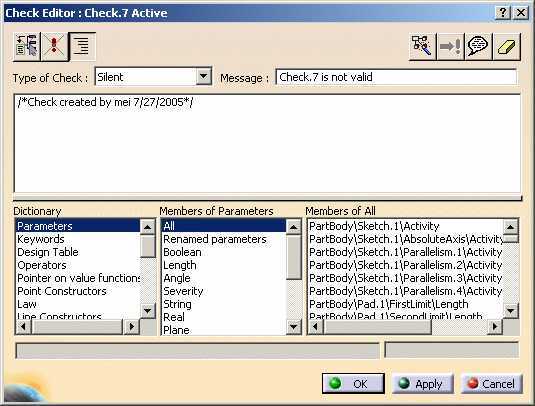 Parameters – A feature defining a document or object property. Formulae – Relations specifying a constraint on a parameter. 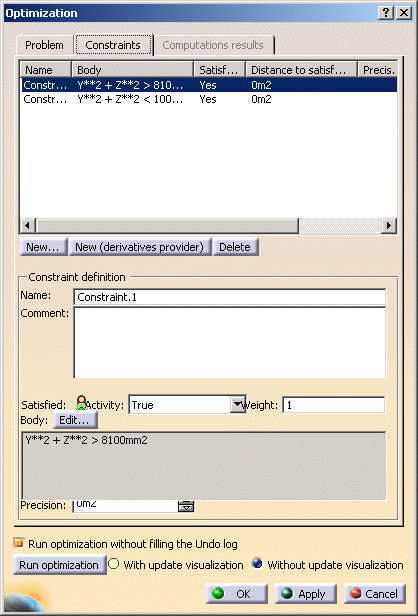 Formula Wizard – A tool provided to assist with the syntax and format while applying a formula to a parameter. Provides a means to create and manage component families. 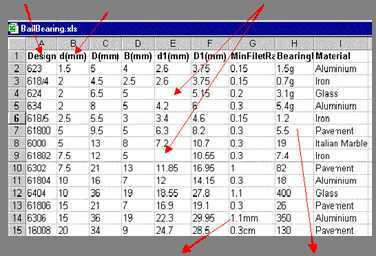 These components can be for example mechanical parts differing in their parameter values. The new context is defined be modifying parameters or replacing specification geometry. 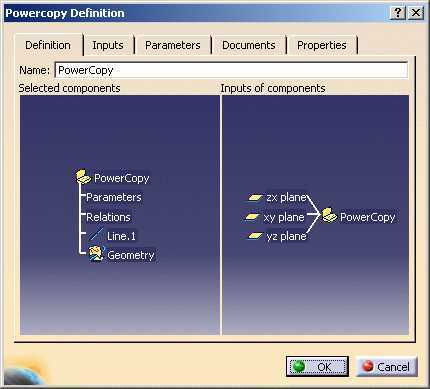 A Power Copy is a set of features (geometric elements, formulas, constraints and so forth) that are grouped to be used in a different context, and presenting the ability to be completely redefined when pasted. 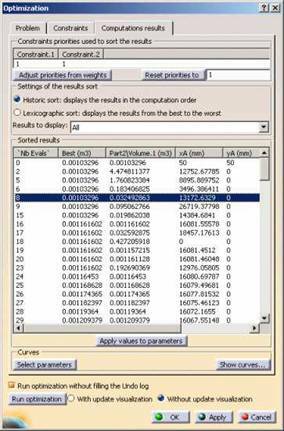 A Graphical interface is provide to guide user through selection of inputs and valuation of parameters. Can be instantiated from a Document or from a feature catalog. The CATIA V5 Knowledgeware turns implicit design methods into explicit knowledge for obtaining the optimum design. Quick assessment of the best alternative for a design amongst numerous combinations of parameters and constraints. The rule and check capabilities require the Knowledge Advisor product. 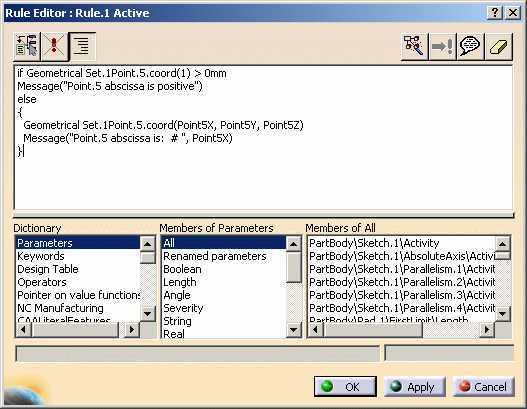 A RULE is a set of conditional statements, whereby the relationship between parameters is controlled. The Knowledge Expert product allows you to create and manipulate relation-type features. These particular features are organized into a hierarchy. Expert Rule: An expert rule is a set of instructions whereby you can start an action for any object having a type defined in a type list. Expert Check: An expert check is a relation which only verifies that a condition is true for all the objects of one or more given types. It does not modify the document it is applied to. 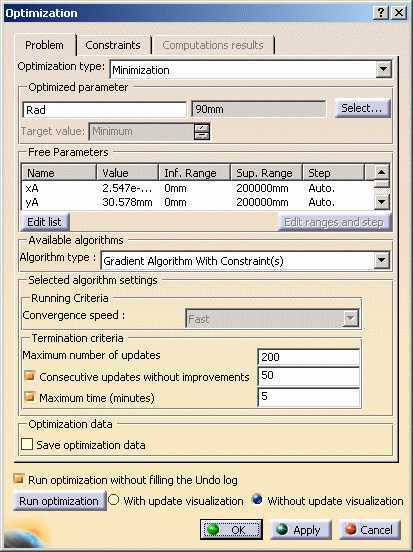 The Product Engineering Optimizer is tool to optimize product and part designs by minimizing, maximizing or targeting specific parameter values. They are limited in scope and flexibility. VB6 & VB.NET– Runs Outside of CATIA, Increased Implementation of Components and Type Libraries, Individual Module Files Makes Collaboration and Sharing Code Easier. 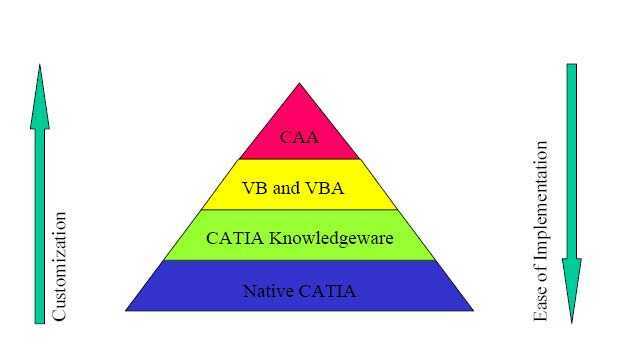 How does VB talk to CATIA? 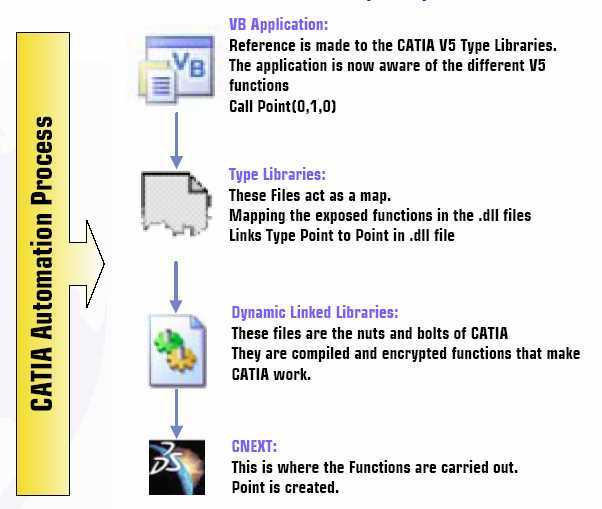 These are compiled files that contain all of the functions that make CATIA V5 perform an action. These files are necessary for “exposing” functions to Windows. 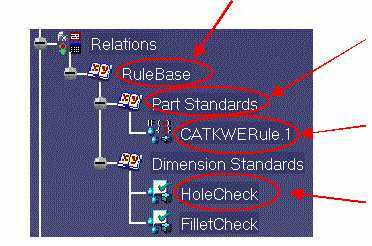 They act as maps which point to the mangled functions inside of the dll files that make CATIA V5 work. The tlb files are located in the UNLOAD directory for V5. More Powerful and Faster than VB, Harder to Learn, Provides Access to Interfaces not currently available to Visual Basic. The Primary language for development is C++. Java is also supported but it not as common.